Bringing things back together went pretty fast. New rod bearings, main bearings, crank girdle installed. Cleaned up the pistons, rods and wrist pins then re-assembled them with new rings. 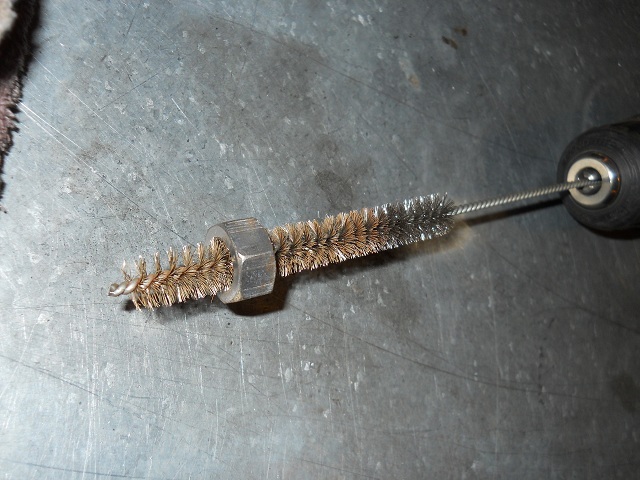 These engine cleaning brushes are cheap and handy, here are a couple of examples of how they helped me with cleaning. 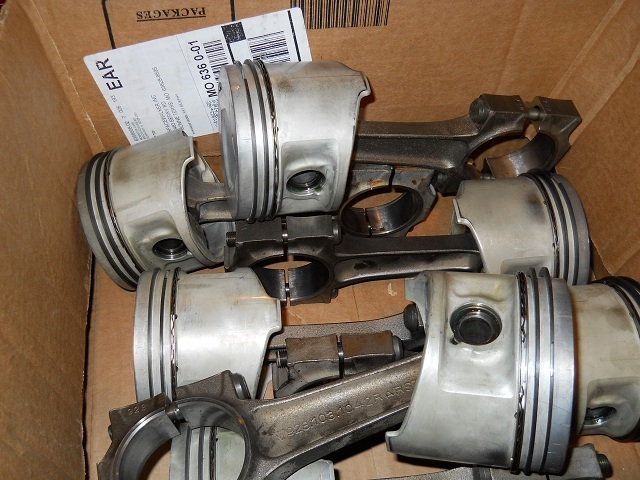 Note, these are not chrome-moly piston rings as were the originals. These are the second set that I received; the first were chrome-moly but were out of spec for ring gap. I returned those and got these. They were quite a bit cheaper but measured correctly, so I decided to go with them - we'll see how they do. At this point you can see I'm waiting arrival of new rod nuts and the assembly lube is leaking down from the pistons. The rod nuts that I received were the wrong size but getting that corrected really wasn't a problem, since I was in no hurry. Here I have things loosely assembled with some of the old nuts - I could only find half of them. Here you can see, I'm going through some test assembly to see how everything fits. I guess I spend a lot of time doing this assemble/disassemble stuff as a sort of inspection. 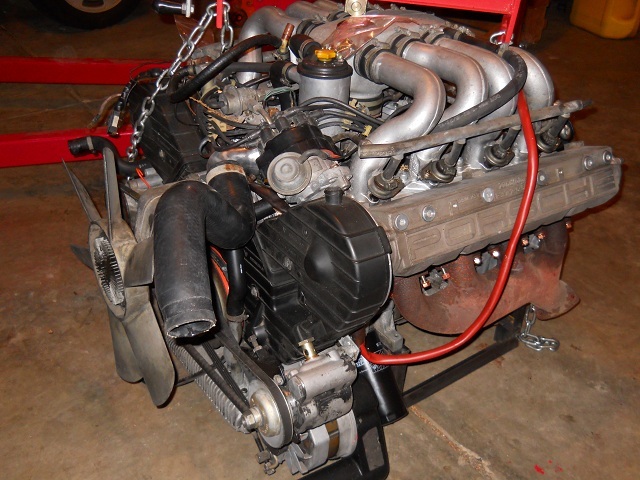 Remember this is my first 928 engine tear down. There really weren't anymore surprises. I thought I would use loctited studs and nylocks to overcome the problems with the oil pan bolts coming loose. But, found the threads in the block were a bit too loose for comfort, so went with the standard bolts. I did use a lot of new fasteners. I debated on switching away from the standard oil pan gasket but in the end stayed with the standard gasket and some old school experience of a liberal application of high-tack sealant. Its not what Porsche recommended but it has always worked for me. Also, I believe the number of unreported disappointments with aftermarket stuff is staggering. Generally, I think the problem with oil pan leaks is attributed to the heft of the oil pan itself. Its heavy and when vibrating, beats on the gasket. 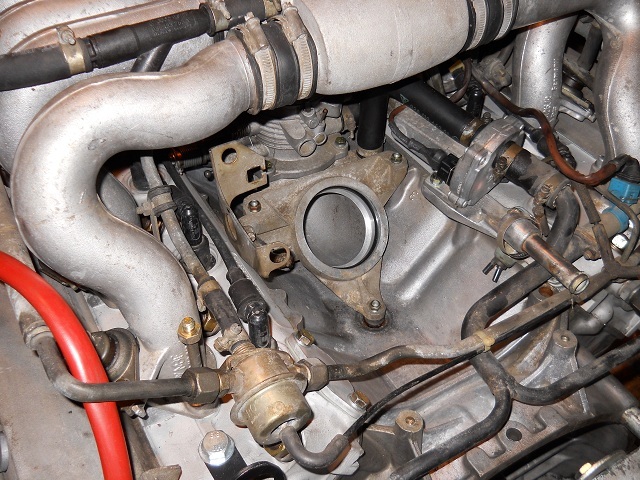 Another factor is that the engine invariably gets set-down on the oil pan some time during installation or even rubs against the cross-member if the motor mounts are bad. 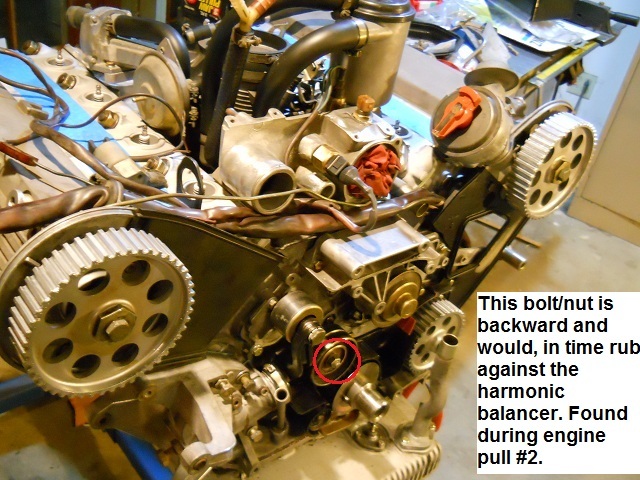 Either way, the weight of the assembled engine damages the pan gasket. Here's a little look-ahead picture of how I dealt with protecting the oil pan gasket during transport from my shop to the garage. This simple support was quick, sturdy and tall enough for me to assemble the clutch. Luckily, it was narrow enough to fit between the legs of my cherry picker. Here's a little peek at the cam tower assembly. You might notice that I failed to pull one of the small seals from the cover - this was a mistake that I didn't catch until I was going through my left-over parts. Arg. Eventually I ended up pulling the engine a second time to fix this. Here' I'm inspecting for a groove in the cam sleeve; it is marginal but passed the fingernail test so I will re-use them (replacements would have been about $100). BTW, I left the seals a tiny bit proud of the cover surface in hopes that the seal lip will ride in a slightly different place on the sleeve. We'll see. 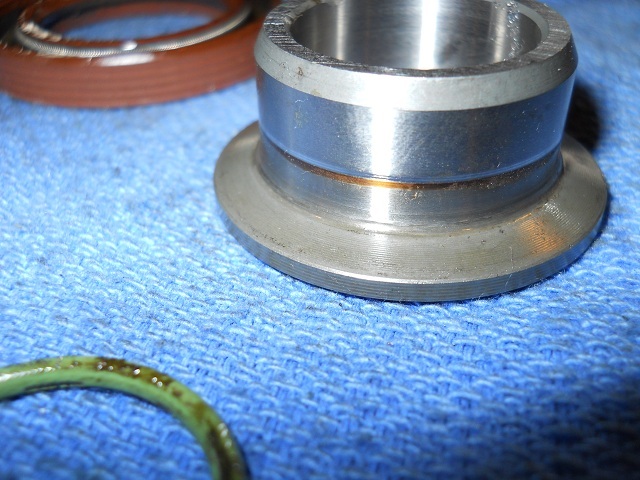 One other note about the gaskets, there were a number of missing ones and the orings provided were basic butyl instead of the red and green viton ones that came out. 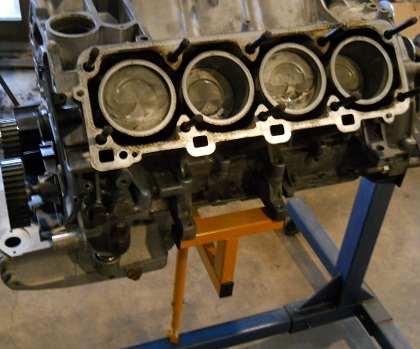 Another problem was with the head gaskets, they were not punched for use with the factory, block/head-locating roll pins - irritating, especially since this gasket set costs over $300. Here, you can see another economizing effort. The three center hoses are the originals, I just cleaned them up with Wesley's tire cleaner. In the process, they get a good inspection and surprisingly several were in good shape, several were replaced too. Obviously, the heads are on now and although hard to tell, the washers under the stud nuts have been sanded rough on a belt sander. Theoretically, this helps them to keep from turning during the torque process but I still had some trouble. Its very obvious though when it happens, the torque is steadily coming up and I could feel the break-away when a washer slipped. I really didn't do much on the electrical connectors, one of the replaced connectors is present though in the center of this next pic. Also if you look close you might see the new plastic bushings on the cam belt idler. The old ones really weren't bad but they are a cheap swap and known to contribute to belt tracking problems. 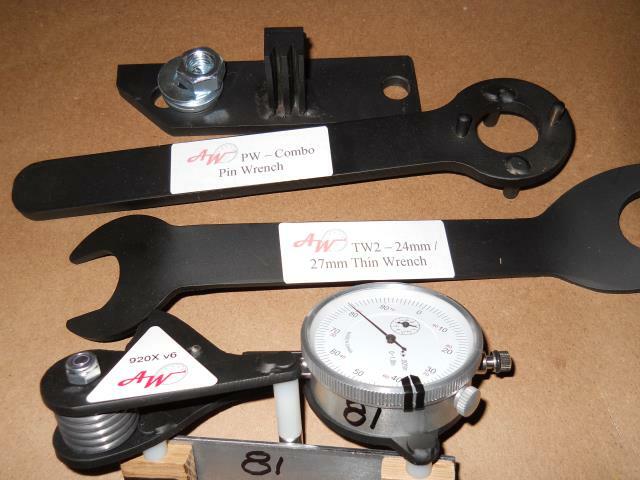 The cam belt tensioner set up is simple and very robust, so keeping this stock is an easy choice for me. One other thing about the pic above. 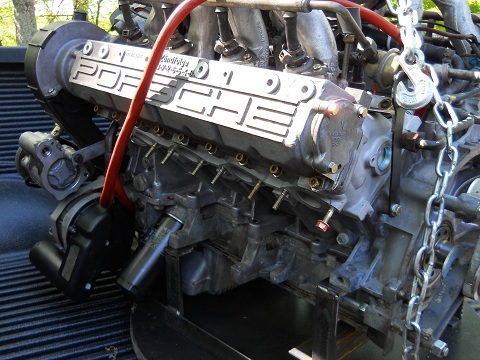 Once I had it all running, and as the engine warmed up I could hear noise. It was scary. 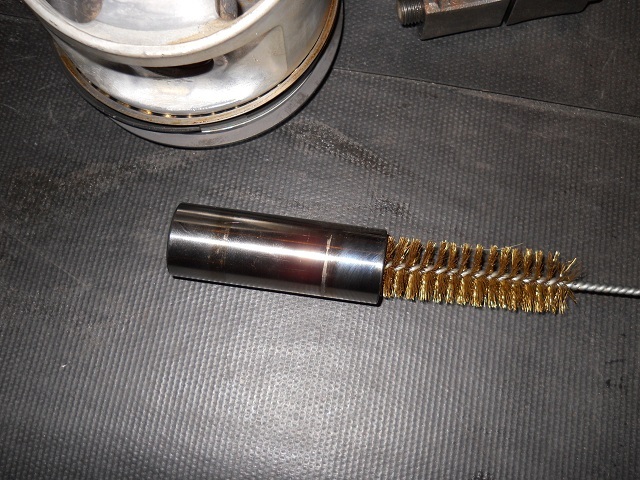 Eventually I found a scar on the backside of the harmonic balancer and traced that to this bolt. A couple of things to note in this next pic... first, compare the red heat sleeve used on the left to the brown cable covering used on the right. The red has held up beautifully, the brown is crusty. I wish Porsche had used only the red. I'm already thinking I should have pulled the 12-pin connector apart and slipped some modern heat sleeve over the cable assembly. I guess I'll save that idea for the refresh. Next, on the lower left corner, you can see one of the fuel regulators, I swapped out the rubber line for it and the other regulator too. The old ones were so hard, they could not have been squeezed closed which is needed to verify the regulators are working. All of the fuel lines I replaced are 5/16 inch ID. Although you can't see it here, the injectors have new seals. 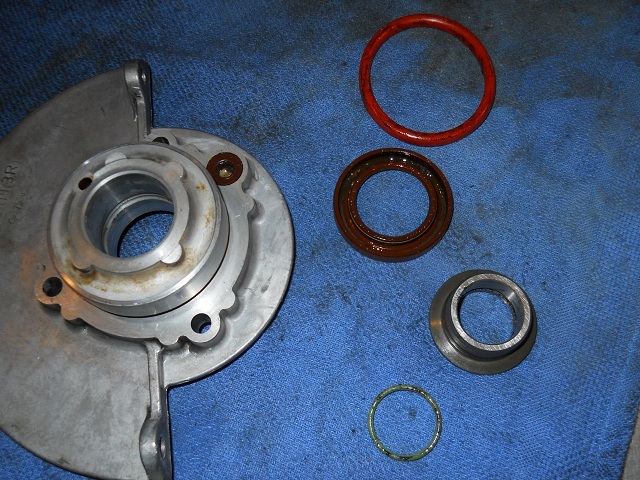 The seals are inexpensive and held together in a bracket with simple circlips. 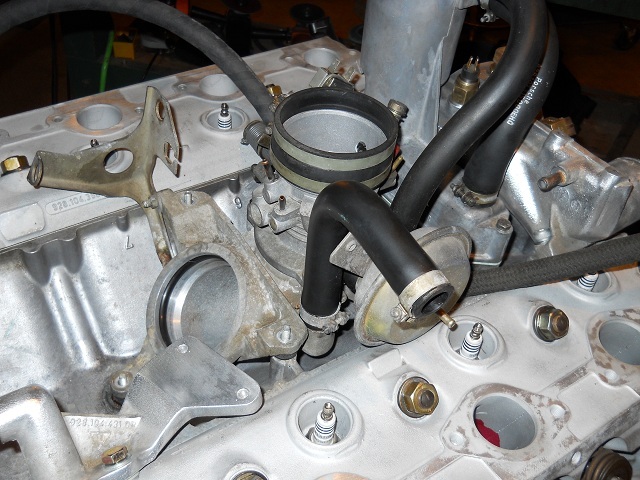 I also got the hose to replace the short 2" injector hoses but it was not the correct hose and would have required clamps - still looking for the correct hoses. 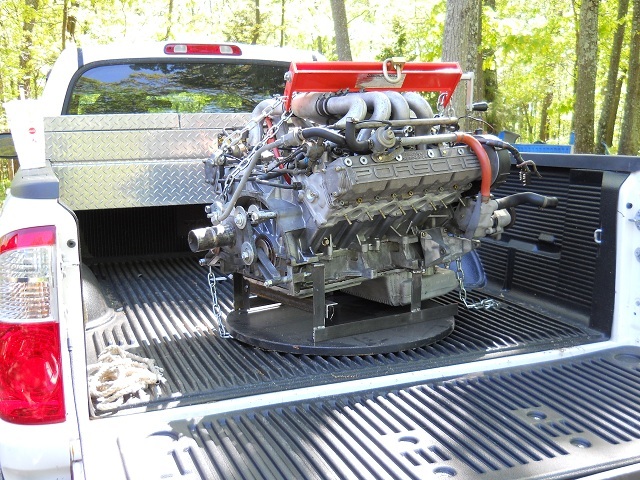 I'l save this for a later date and maybe clean-up the intake better at that time too. In this next image, you can see the new exhaust studs. Originally I made up some studs from a long piece of all-thread but, in the end, opted for the much more costly ($80) Porsche studs. 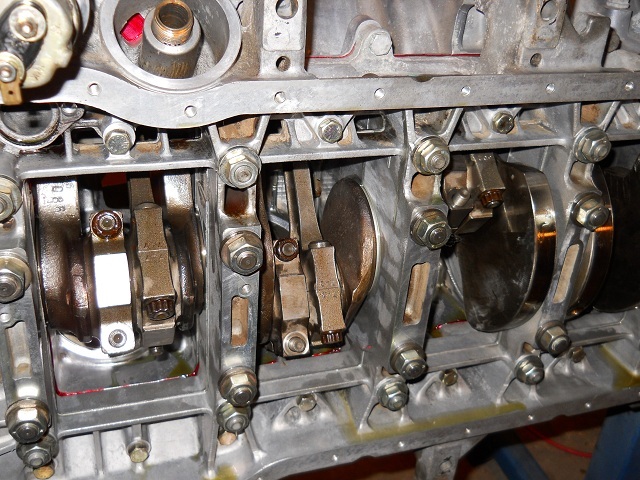 My rationalizing was that I REALLY did not want to pull this engine again for a simple stud problem. 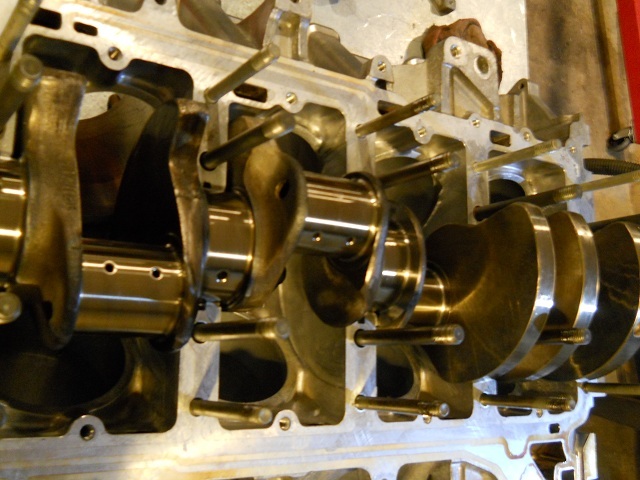 And since the heads are aluminum and the manifolds are cast iron, the chances of breaking one are, well, a little higher than with the old cast iron head engines that I grew up with. Also note the copper coated nut. I really like these for anything exhaust. They have a small 12mm head and have long ago proven themselves worthy in the very demanding 911 world. They're cheap too. OK, so working on the floor is not so much fun, but you can see things are coming along. The manifolds are on (just need a couple of washers to finish that and then figure how the radiator hoses connect up. I'm a little worried about the fan, on some days it seems to spin with almost no resistance. At other times, it is stiff like I think it should be. It would really irritate me if the thing failed and took out an expensive radiator. Tomorrow this puppy goes in, follow along here.